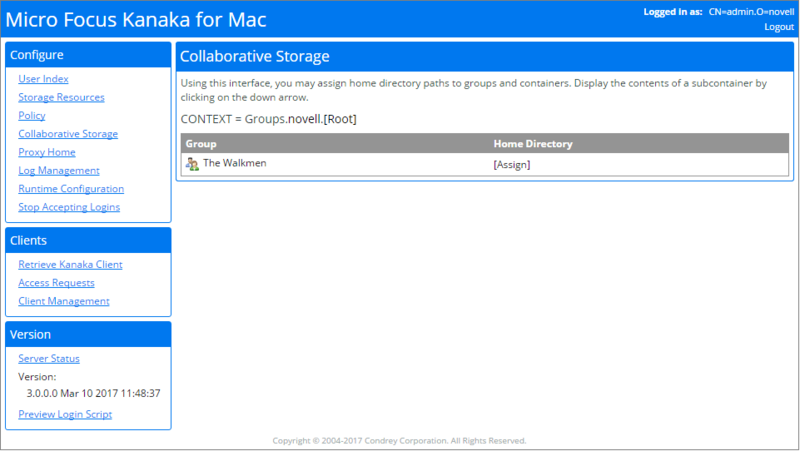 Micro Focus Kanaka for Mac has the capability to automatically mount collaborative (group) storage on macOS. It does this based solely on the identity of the user. Micro Focus Kanaka for Mac uses the Home_Directory attribute, and now the login script attribute, to locate and mount the storage. The concept of using the Home_Directory attribute to manage group storage originated with Micro Focus Storage Manager, which is a policy-based storage-management solution that revolutionizes use of the OES file system. Micro Focus Storage Manager unites the user-provisioning functionality of eDirectory solutions with the storage-provisioning capabilities of the OES file system. As a result, Micro Focus Storage Manager completely automates the creation, management, and deletion of personal and collaborative storage, delivering the industry's only identity-based storage management solution. Micro Focus Storage Manager extends the Home_Directory concept to the group by adding a ccx-FSFManagedPath attribute to the group object. Therefore, much like a single user’s home directory, it is easy to locate the storage for the group simply by looking at the ccx-FSFManagedPath attribute of the group. 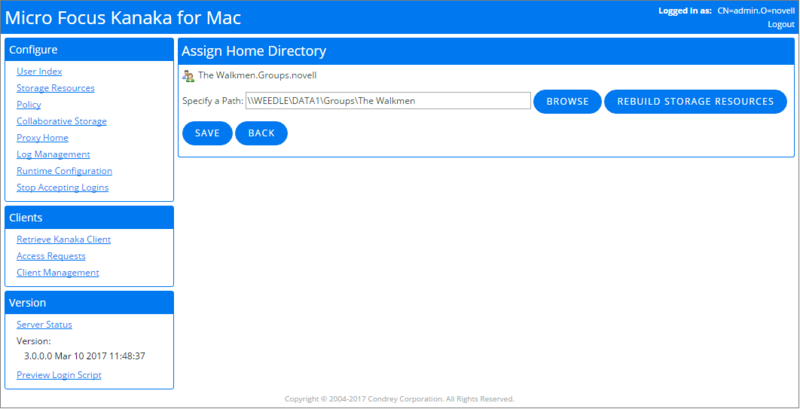 Micro Focus Kanaka for Mac leverages the Home_Directory attribute of the user object to locate and mount the home directory for the given user. Micro Focus Kanaka for Mac also leverages the group home directory concept introduced by Micro Focus Storage Manager by running the group membership list for the user and pulling the ccx-FSFManagedPath attribute for each group the user is a member of and mounting each group directory on macOS. However, Micro Focus Storage Manager is not required for Micro Focus Kanaka for Mac to deal with collaborative (group) storage. When the Micro Focus Kanaka for Mac schema extensions are applied to the tree, the Micro Focus Storage Manager ccx-FSFManagedPath attribute is also added, if it is not already present. This Web interface provides a methodology for assigning the group ccx-FSFManagedPath attribute for each group in the tree, analogous to setting the Home_Directory attribute on a user. If all group storage is already managed with Micro Focus Storage Manager, there is nothing that you need to do for Micro Focus Kanaka for Mac to mount group storage for all users. Otherwise, you should use Micro Focus Kanaka for Mac to assign the ccx-FSFManagedPath attribute for each group that is not managed by Micro Focus Storage Manager. Simply click Browse the Tree in the menu to the left, locate the group, and click Assign. This allows the administrator to browse to a destination path and set the attribute for the given group. IMPORTANT:The Engine does not assign the chosen object as a trustee of the directory. You should perform this step via traditional methods.